Caring Is Not Only Sharing...: Bye To 2013, Hello 2014 !! Bye To 2013, Hello 2014 !! 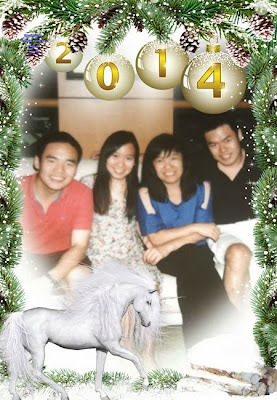 Let's gallop in the 2014 with a cheerful heart! I am wishing you again and again HAPPY NEW YEAR 2014 TO YOU AND FAMILY! You have such a lovely and loving family because their mama is lovely and loving to them! Keep smiling a lot like Colgate Ads in 2014 ok. Who knows you might get ad offers from Colgate or Darlie for your toothsome & happy smiles. Happy new year 2014 Claire!! Claire, Happy New Year 2014!!! Good luck, good health, God bless all of us and our loved ones. Happy New Year, 2014. Thought toy have a great year , been found here and there ! Happy new year ! Happy new year to you and family. All the best wishes for 2014, Claire. Happy New Year to you & loved ones. Stay healthy & happy. Thank you everyone!! May all your wishes come true!